Library image #4065: South end of Forrester Island. Southern most point in Alaska. The United States Congress designated the Forrester Island Wilderness (map) in 1970 and it now has a total of 2,832 acres. All of this wilderness is located in Alaska and is managed by the Fish and Wildlife Service. During the day you'll ask yourself how more than one million birds of 13 species could be nesting here. But at night vast populations of Leach's storm petrels, fork-tailed petrels, Cassin's auklets, and rhinoceros auklets leave their underground burrows to feed in the ocean around the isolated islands of Forrester, Lowrie, and Petrel. An estimated 780,000 storm petrels nest on Petrel Island alone. Forrester Island itself rises roughly 1,300 feet out of the sea and lies under a heavy forest of spruce and hemlock with a few lodgepole pine and red cedar bordering open muskegs. In small ravines and in areas of windfall on this mountainous piece of land the thick scrub, a web of berry bushes and devil's club, discourages travel. The shoreline has many sheer cliffs and few beaches, as does the shoreline of Petrel Island, which is also heavily forested. The nearby Lowrie Islands lie essentially flat. To schedule your visit for the best time, avoid the spring nesting season. Almost all the available soil contains lengthy burrows, and one false step could end many of the lives developing within buried eggs. 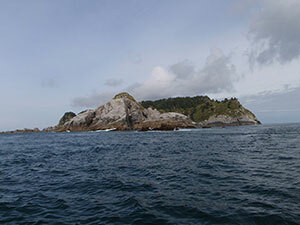 Forrester Island Wilderness receives 73.5 inches of precipitation each year with summer temperatures averaging in the low 50s and 60s (Fahrenheit) and in the low 20s and 30s in winter. Planning to Visit the Forrester Island Wilderness? How to follow the seven standard Leave No Trace principles differs in different parts of the country (desert vs. Rocky Mountains). Click on any of the principles listed below to learn more about how they apply in the Forrester Island Wilderness.